Decomposition tool: Our latest data to 2015 in a user-friendly tool to understand what are the factors explaining the variation of energy demand by sector in EU countries. 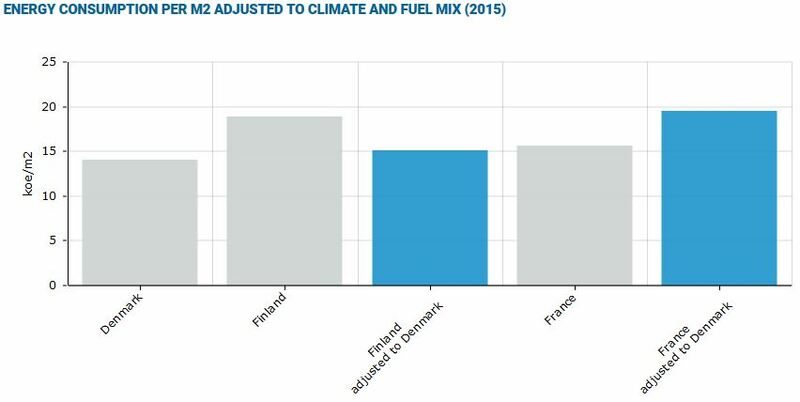 The tool shows that, for the EU as a whole, the 8% reduction in the final energy consumption (or -91 Mtoe) between 2007, the pre-crisis level, and 2015, was due for a large part to energy savings (113 Mtoe), but partially offset by an increase in demography and changes in lifestyles (around 20 Mtoe each). Comparison tool: Compare easily energy efficiency performance of one country with selected reference countries for the last year available 2015. 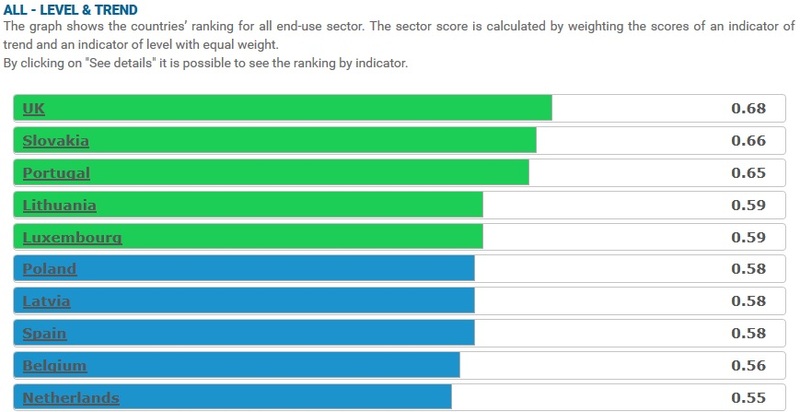 Scoreboard on energy efficiency levels and trends by sector through selected indicators. UK, Slovakia and Portugal rank among the top 3 for the combined scoreboard on level (2015) and progress (2000-2015). The ranking by sector is different. Successful policies: Easily identify successful or innovative measures across different countries. The brief and webinar give an overview of the most important policy measures that deliver Article 7 EED energy saving targets and underline the different approaches that MS have taken when implementing Article 8 of the EED. The brief and webinar analyze the effect of the economic crisis on energy consumption in industry and propose a decomposition of the variation of the industrial energy consumption post-crisis. This brief proposes an overview of the final energy consumption of Heating and Cooling in EU countries and underlines key measures dedicated to the heating systems. This brief analyses key points of the DAFI Directive in transport and presents the Spanish situation under the national policy framework. The ODYSSEE database has been updated with energy data and their drivers up to 2015. The MURE database has been updated with most recent energy efficiency policies and measures that were implemented in the EU 28 Member States, Norway and Switzerland until the end of 2017. Measures related to the fourth National Energy Efficiency Action Plan (NEEAP) have been introduced in the database. The database now contains more than 2530 detailed measure descriptions, many of them with impact evaluation. Unique database on energy consumption, their drivers and energy efficiency indicators for all EU countries (and Norway) updated to 2015. New ! First key 2016 data available in March 2018. Database on energy efficiency policies and measures. Valuable and trusted policy tool including recent measures by country. 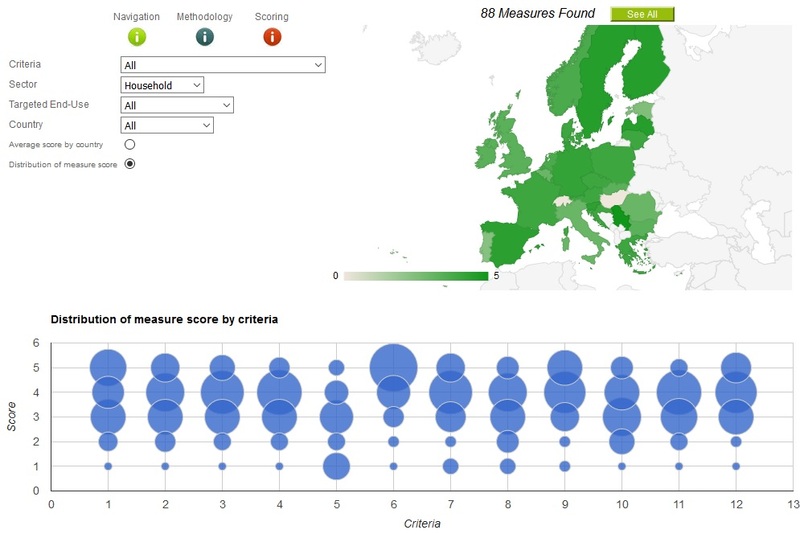 Selection of graphs with short analysis describing energy efficiency level and trends across EU28 countries.